While the Seagate Momentus XT Hybrid sounds like a nice balance of performance and capacity there is a better hybrid storage solution. 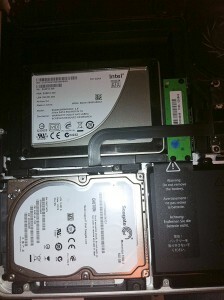 Just install two hard drives in your MacBook Pro. Use an SSD for your operating system, and parts of your home directory, and use a mechanical hard drive for storing your data. First lets take a closer look at the Momentus XT Hybrid. It’s a traditional mechanical 7200 RPM hard drive with an onboard 4 GB SSD. The drive uses the 4 GB SSD to cache files that are frequently accessed. Over time the drive becomes smarter and the most used files will be read from the SSD. This sounds great, except it’s only 4 GB. The operating system and a few applications will use all this space. I run VMWare on my machine along with applications like Photoshop and Lightroom. I want all my Applications to be stored on SSD, and just the larger data files (virtual machines, photos, movies, music, etc) to be stored on a mechanical drive. optical bay converter. I chose this one from OWC. SSD drive. I’m running an 80GB Intel X-25M G2. But I’d recommend a drive with a sandforce controller. A mechanical hard drive. I went with a fast and quiet Seagate Momentus 7200.4 500GB. The installation is very straightforward. OWC provides excellent instructions and all the tools necessary to complete the installation. Once you’ve got OS X installed (cloned) onto the SSD then go through the following process to move folders from your home directory over the 7200 RPM drive. Copy the directory (Music for example) over to the data drive. Delete the directory from the SSD. Create a symbolic link to add the directory back to your home folder. This entry was posted in Random and tagged 7200RPM, Apple, MacBook Pro, performance, sandforce, SSD, storage. Bookmark the permalink. Interesting post. Did you see any significant performance increase on the mac by changing the OS and apps to the SSD? Oh yeah. Huge performance increase by having the OS and apps on the SSD. I’ve had an SSD as the boot drive every since I bought my 13″ MBP. After using an SSD I find it hard to go back. Though I don’t often reboot, it will boot up much faster (maybe 20 seconds or so). But probably the biggest thing I notice is that apps open instantly and the system just feels very responsive. As a developer I don’t want any latency when I’m building or updating files. I was using just an 80 GB SSD for the longest time but was constantly running low on space. So I figured why not throw a 500 GB drive in. I can count the times I’ve used the optical drive on one hand. The only issue with this is the face that the optical drive’s SATA interface doesn’t support the sudden-motion-sensor that safely stops the hard drive’s needle when it senses a jolt, or shock. So you’re much more likely to destroy your drive by accidentally bumping your laptop somewhere.